Help your customers smell sweet all day long with our selection of wholesale deodorants! Order by 12pm and in most cases receive your products the very next day! If it's your first order, you can get 10% off using code FIRST10. As a one-stop shop for all your wholesale health and beauty requirements we stock an extensive range of wholesale deodorants from some of the industries’ biggest brands! From Lynx and Gillette to Impulse and Sure we stock all your customers’ favourite wholesale deodorants. Catering for both men and women our range of wholesale deodorants help to neutralize the smell of sweat and provide protection for long periods of time, which means users don’t have to worry about the lingering smell of body odour. For men looking to keep cool and confident all day Gillette Cool Wave Body Spray is tough on body odour, has a crisp, cool fragrance and is long lasting. Likewise Sportstar Body Spray provides long lasting protection against embarrassing body odour and is kind on the skin. Specially formulated with up to 48 hours protection Sure For Women is available in two fragrances; Clear Aqua and Bright. Containing 0% alcohol this wholesale deodorant will leave women feeling fresh all day long. 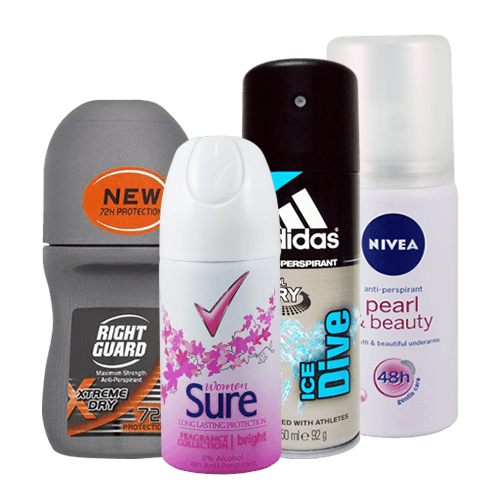 We also stock a large selection of wholesale deodorants from leading brand Impulse. Helping to neutralize body odour Impulse body sprays are available in a range of fragrances including True Love, Very Pink, Hint of Musk, Into Glamour, Sweet Smile, Temptation and Tease. With over 95 years experience working alongside the retail sector we understand that many consumers suffer from sensitive skin, but don’t worry! We supply wholesale Dove Deodorant for women, which provides up to 48 hours protection and doesn’t leave those annoying white marks. Make the most of our exceptional customer care, benefit from our timely and reliable delivery service and experience our all-new rewards scheme when you purchase wholesale deodorant from us here at Harrisons Direct. Need more information on purchasing wholesale deodorant? Don’t hesitate to get in touch, call our customer care team on 01254 306840 now!